Terrorists in Gaza have acquired anti-aircraft and anti-tank rockets from Libya during its six-month civil war, Israeli officials say. Terror groups based in Gaza have acquired anti-aircraft and anti-tank rockets from Libya during its six-month civil war, Israeli officials told Reuters on Monday. The officials said the weapons from Libya have enlarged, but not significantly improved, the arsenal in Gaza. They emphasized that while the rebellion against Muammar Qaddafi has stirred concern abroad about the fate of Libya’s chemical weapons stockpiles, there is no indication Hamas or other Gaza-based terror groups have sought them. They noted, however, that an inflow of SA-7 anti-aircraft missiles and rocket-propelled grenades (RPGs) has been detected as entering Gaza. One official described an overland supply route that opened up between eastern Libya, after it fell to the rebels, and the Gaza Strip, via Egypt. Another Israeli official told the news agency that “thousands” of the weapons had reached Gaza in recent months but did not provide figures on how many had originated in Libya. 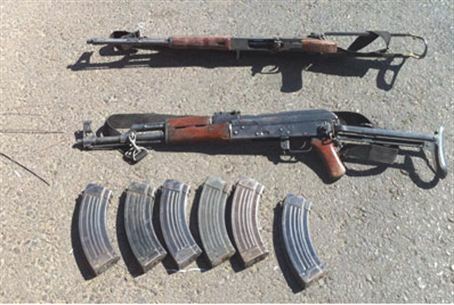 Smuggling of weapons meant for Gaza terror groups is, however, a major concern for Israel, particularly with the anarchy in the Sinai Peninsula and the infiltration of terror groups into the region following the fall of Hosni Mubarak. Egypt, which has been attempting to crackdown on terror groups in the Sinai, deployed 1,500 more troops in the region on Monday following an agreement with Israel to increase the number of Egyptian troops in the peninsula’s areas B and C.
The entire area is on alert, and the IDF has beefed up its presence in the south amid a report that Islamic Jihad terrorists from Gaza are planning to attack from the Sinai Peninsula, in Egyptian hands since Israel gave it up for peace in the 1979 treaty with Egypt.